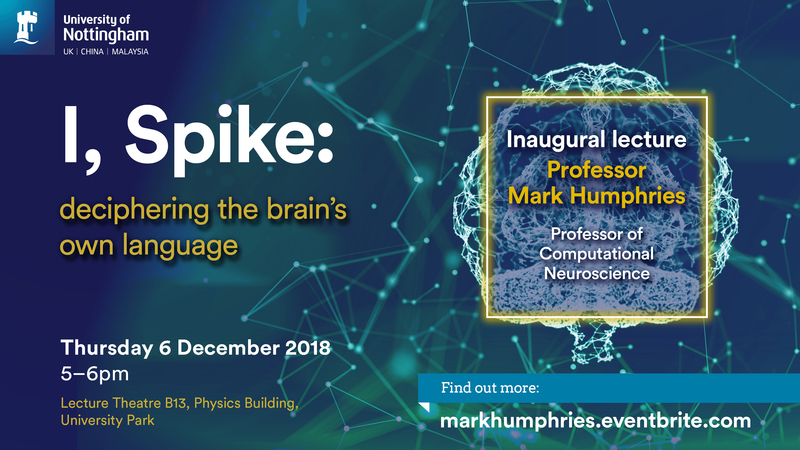 Inaugural lecture of Professor Mark Humphries, Professor of Computational Neuroscience. I’m giving my Professorial inaugural lecture on December 6th, about brains. Your brain is made of neurons, and those neurons talking to each other is how you do, well, anything: see, hear, and smell; think, plan, and do. Long intrigued by this fundamental fact of life, my research has tried to make sense of how neurons work together to make bodies function in the world. In my lecture, we’ll see how I’ve attempted to make sense of the collective activity of neurons all over the brain, from the depths of the basal ganglia to the enigmatic prefrontal cortex, and even in sea-slugs. Along the way, we’ll uncover some of the deep mysteries of the brain, including the dark neuron problem. Irritatingly, dopamine keeps popping up everywhere – even in the sea slugs. For while brains may be unfathomably complex, they seem to be unfathomably complex in the same way in all animals. This event will take place on Thursday 6 December at 5-6pm in Lecture Theatre B13, Physics Building, University Park. Please arrive at 4.30pm. Refreshments will be served after the lecture. For more information, and to book your place, please visit the event page.